QUICK CHARGE - ULTRA-EFFICIENT: Equipped with SunPowerTM solar cells that generate up to 25 - 30% extra power compared to others, the solar charger converts up to 24% of the total solar energy. Means, you'll have more power, more energy, within a short period of time resulting in quick charging duration, ability to charge your device even in odd weathers, etc. DURABLE - CORROSION & CRACK RESISTANT: The flexible design and tin-copper metal system along with the nylon body enable the device to tolerate even the extreme conditions. Designed for frequent uses, it comes with all the perks to keep your devices up! No need to be scared of a windy or showering day, your devices would remain functional all the time. The only thing you need is the sun (so don't even try during nights). 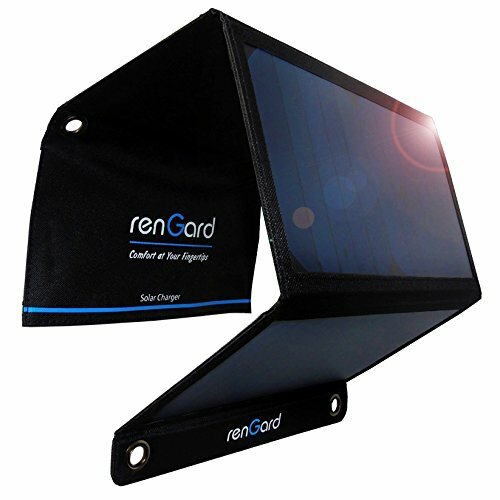 YOUR TRAVEL BUDDY - PORTABLE: RenGard Solar Charger is highly portable, lightweight, easy to carry, and efficient. Plus it supports almost each N every portable device - be it a smartphone, iPad, Tablet, Kindle, eBook reader, GPS... anything that comes with a USB port for charging purpose. SELF-FUNCTIONAL & ECOFRIENDLY: 100% lead-free built, the device never harms our eco-system. Instead, it allows us to rely on the alternative energy sources for your power needs, hence helping Mother Nature. However, it's damn easier to use. Comes with a built-in smart chip that enables the smart functions, like - automatic start, etc. YEARLONG WARRANTY & CERTIFICATION: The device comes CE, FCC, ROHS, and PSE certified. Plus we offer a 12-months guarantee for any defects or problems not caused by human error. So be confident with your purchase and click that 'ADD TO CART' button now! Soon enough, the prices would be much higher. If you have any questions about this product by RenGard, contact us by completing and submitting the form below. If you are looking for a specif part number, please include it with your message.